Student debt is crushing the American dream for millions of students and college graduates. 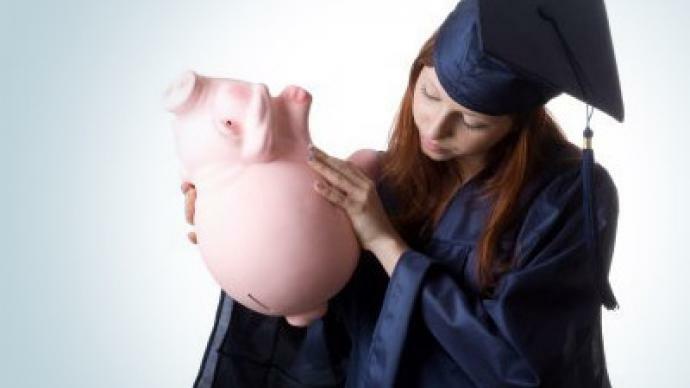 For the first time in the US, total student debt has surpassed one trillion dollars. Americans now owe more in student loans than credit card debt. ­This comes as unemployment among college graduates is at an all time high. President Obama recently announced his plan to ease student loan debt, which would consolidate public student loans a better interest rate. But his plan will not help millions of Americans already drowning in debt, and it excludes private loans. Students can get into trouble with private loans because they are not protected by the government and typically have higher interest rates. MoveOn.org has launched a petition to eliminate student debt, which has garnered nearly 650,000 signatures. “If you put more money into the hands of people, they're going to spend it. And that will create demand, it will create economic growth, and it will create jobs,” says Moveon.org’s Robert Applebaum, who launched the petition. Applebuam says bailing out students rather than the banks will better stimulate the economy by putting more cash in the pockets of the educated middle class. “They're not starting businesses, they're not buying cars, they're not buying houses, they're not starting families, they're not having children,” says Applebuam. In other developed countries, getting a college education is not such a financial burden. “You have free tuition in France, in Denmark, in Sweden,and Finland, they don't pay anything at public universities,” says Mark Weisbrot, co-director at the Center of Economic Policy Research. And when they do pay, the price tag isn’t as shocking as it is in the US. “In the 21 countries in Europe for which we have data, there's only four that have tuition more than 1200 dollars,” says Weisbrot. Compare that to an average of $8,244 for public colleges and $28,500 for private colleges, according to an analysis by the College Board. Many institutions charge much more. And it’s not getting any better. Tuition has skyrocketed 439 percent since 1982. This year alone, costs shot up over 8 percent for public colleges. Occupy Wall Street Protesters say this is yet another example of rising inequality in the nation, with millions shackled to student debt for decades.